BIRDSONG PRINCESS SONJA was born on March 14, 2010 and will be celebrating her 7th birthday next month. 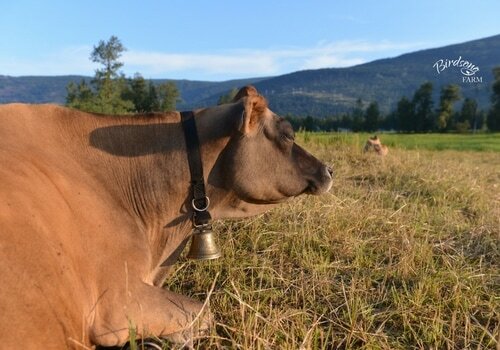 Sonja is part of my "Princess" cow family and was named after Queen Sonja of Norway, in keeping with my royalty theme and in honour of the Norwegian heritage that I share with her dam's breeder. 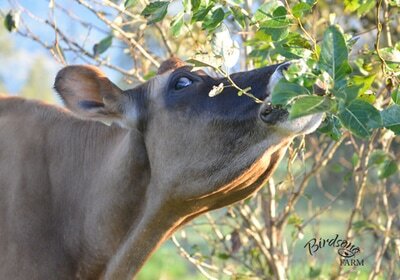 She is sweet and friendly and great with kids, which will make her an excellent family cow. 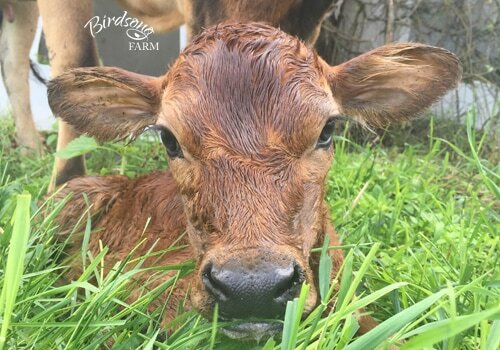 Pedigree: Sonja was the first purebred heifer born on Birdsong Farm, and she is registered with Jersey Canada; please click here to view her pedigree. Sonja's sire is SELECT-SCOTT MINISTER EX 90, and he is one of my all-time favourite Jersey sires. 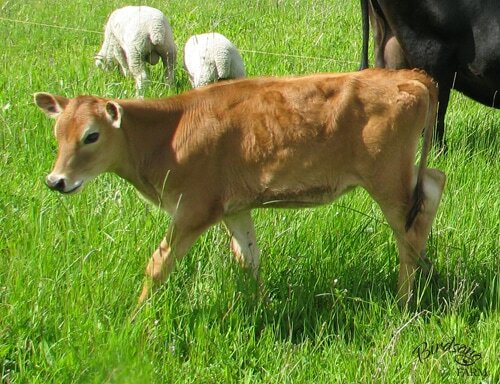 Her dam is GAYMAR JUST A PRINCESS, and she is backed by five generations of Very Good and Excellent cows. At 6.85%, Sonja's inbreeding percentage is still within the recommended 7% or less. Offspring: Sonja's first calf, Kesler, was born on March 26, 2012, and he was followed by four heifers: Grace on May 3, 2013; Alexandra on May 30, 2014; Charlotte on July 3, 2015; and Sophie on June 24, 2016. I never assisted at any of her births. When breeding Sonja, I highly recommend that you look for a bull with excellent udder traits (a shorter, tighter udder with added height and width to the rear, a strong median suspensory, and shorter teats), and a good rump (increased pin width). 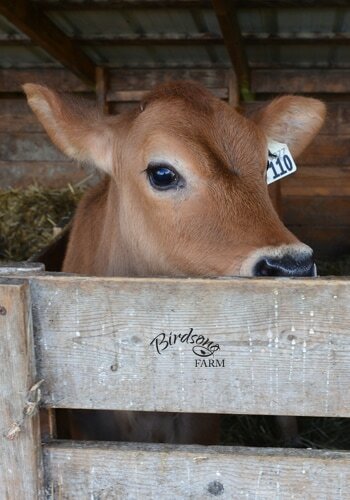 If you breed her with a registered Jersey bull, you can register the calf with Jersey Canada. Milk: After Sonja's first calf was born I milked her by hand twice a day, and would weigh her milk after every milking for my records. You can ask to view her unofficial milk records, and if you wish, the unofficial records for her mum, Princess; her paternal half-sister, Aster; her maternal half-sister, Diana; and her daughter, Grace. 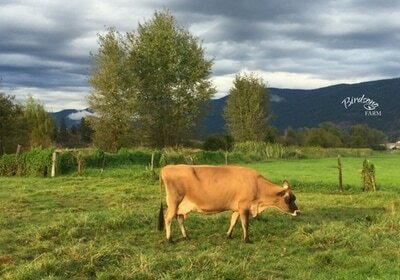 In early August 2015, I took Sonja to the dairy farm where I was working, and while there she was milked by machine in a parlour and enrolled in the CanWest DHI milk testing program. When that farm closed in January 2017 I took Sonja to my neighbour's dairy farm, where the cows are milked with a robot. I test all of my heifers for Beta Casein and Kappa Casein type, and Sonja is type A1/A2 and type B/B, respectively. 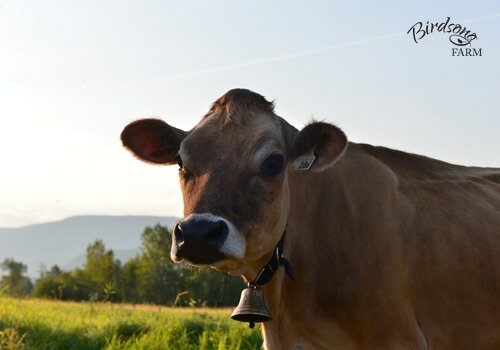 Sonja averages between 10 and 15 liters of milk a day, and peaks at 20+ liters a day shortly after freshening, with an average of 5.1% butterfat and 3.9% protein. She has a history of poor lactation persistency and I dried her off at 272 and 244 days in milk on her 4th and 5th lactations, respectively. 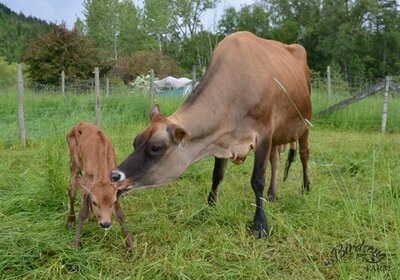 Sonja has nice-sized teats for hand milking, and nearly all of my brothers and sisters and many of my friends learned how to milk with her. I trained her to stand still for milking without being tied, and in the summer I would walk out to the field and milk her wherever she was standing. ​Genetics: I tested Sonja with the 80K genotype panel, and she has a Direct Genomic Value, or DGV, of 874 (16*Dec; 57% reliability); please click here to view her genotyping report. In addition, she is tested free of Jersey Haplotype 1 (JH1) and Jersey Haplotype 2 (JH2). Classification: Sonja was classified twice. 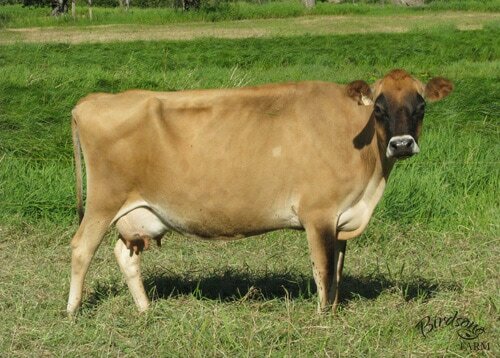 She was scored Good Plus 83 (GP 83) at 2 years and 6 months of age, and her score was raised to Very Good 85 (VG 85) at 3 years and 6 months of age; please click here to view her classification report. Sonja's dam, Princess, was never classified as I wasn't aware of the program before I sold her, but her paternal half-sister, Aster, is scored as Good Plus 83 (GP 83) and her maternal half-sister, Diana, is scored as Good 78 (G 78). 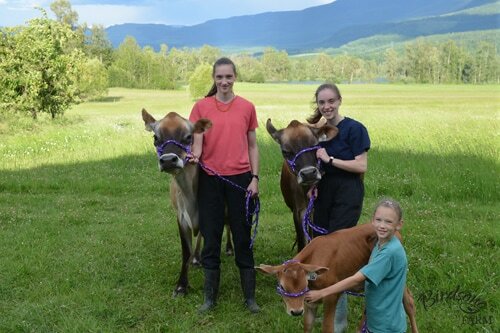 Sonja's daughters, Grace and Alexandra, are scored as Good Plus 84 (GP 84) and Good 77 (G 77), respectively. Prizes: I enjoy taking my heifers and cows to the fair, and started my annual tradition of attending the Armstrong IPE with Sonja in 2011. She was 4th place Junior Yearling in 2011, 5th place 2-Year-Old in 2012, 2nd place 3-Year-Old in 2013, 3rd place 4-Year-Old in 2014, 3rd place 5-Year-Old in 2015, and 4th place Mature Cow in 2016. Sonja was a key part of my Breeder's Herd as well, which placed 3rd in 2013 and 2014 and 4th in 2015 and 2016. 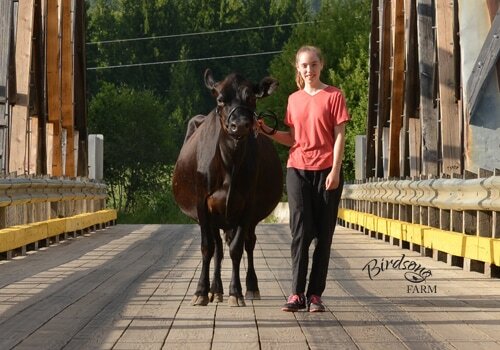 Her dam, Princess, was an Intermediate Calf in 2006 and she placed 2nd at the Calgary Dairy Classic and the Chilliwack Exhibition. 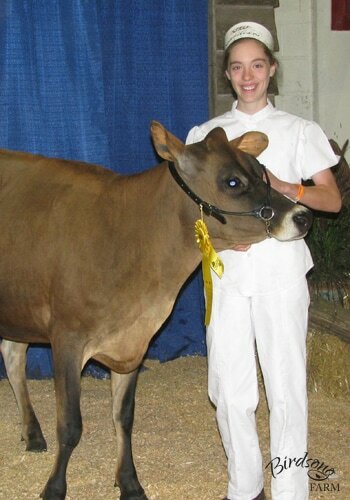 As an Intermediate Yearling in 2007 she placed 2nd at the Calgary Dairy Classic, 1st at the Chilliwack Exhition, and 3rd at the Red Deer Championship Show. Her first daughter, Grace, was 3rd place Junior Calf in 2013, 1st place Junior Yearling in 2014, and 3rd place Junior 2-Year-Old in 2015 at the Armstrong IPE. She was 3rd place 3-Year-Old in 2016 at the North Okanagan Spring Show. Her second daughter, Alexandra, was 4th place Summer Yearling in 2015 and 4th place 2-Year-Old in 2016 at the Armstrong IPE. 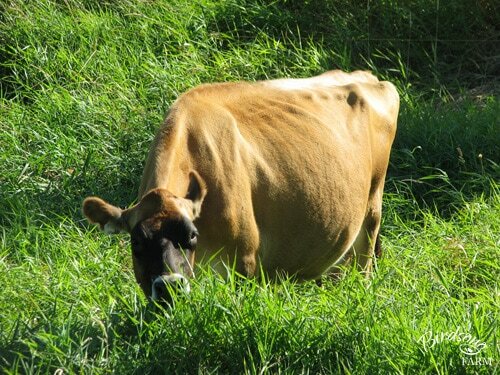 Health: While my cows are not grain-free, they are grass-based. I feed grass/alfalfa hay and haylage and give my cows access to grass pasture in the warmer months, and a maximum of 4.5 kilograms of grain twice a day after milking. 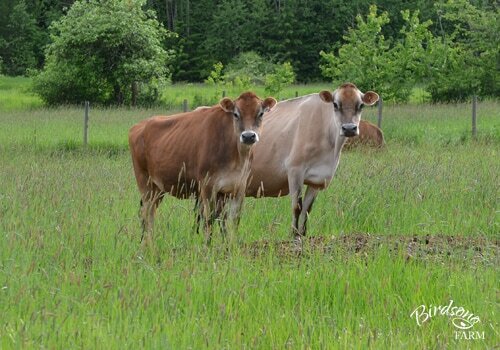 Sonja is from a cow family that is known for calving and milking while in their teens, with her great-granddam still milking at age 18. Sonja is following in their footsteps and is a very healthy cow with two very minor health issues in seven years: mastitis in her right rear quarter November 2014 and milk fever after calving in July 2016. I treated her mastitis with Cefa-Lak, and it has never recurred. The milk fever was because I made the mistake of not giving her a calcium bolus after the birth of her fifth calf. I vaccinate annually with Triangle 5 and Covexin Plus (Sonja was vaccinated in July 2016), and I give all my Jerseys a magnet when they are heifers in case they eat a nail or other sharp piece of metal (Sonja received her magnet in 2011). 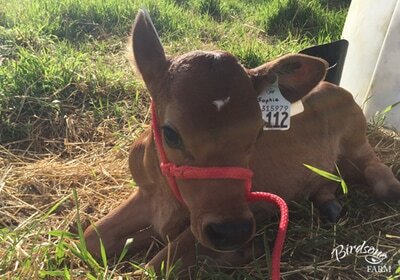 Sonja has a history of poor lactation persistency, so I would recommend breeding her within 60 to 90 days after freshening for an annual calf. I breed my cows with artificial insemination, and Sonja always catches on the second or third breeding (if my timing isn't off). Price: Sonja is one of my favourite cows and I always thought that I would keep her forever, but the dairy farm where I was working and boarding my Jerseys closed at the end of January and now I need to sell a couple of my cows. She is sweet and friendly and great with kids (nearly all of my brothers and sisters and many of my friends learned how to milk with her), and she will make an excellent family cow. I am asking $3,000 for Sonja as a 7-year-old, dry (not milking), and bred cow. She is not bred right now, so I will be breeding her and ask my veterinarian to confirm that she is indeed in calf before she leaves. 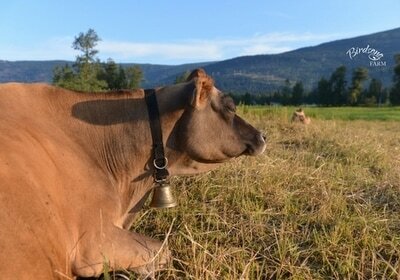 If Birdsong Princess Sonja sounds like your dream cow, please send Naomi Fournier an email at milkmaid@naomisbirdsongfarm.ca.